Throughout South America, I have had a difficult time finding a vegetarian restaurant that uses different grains and proteins to create a rich and succulent flavor in their food. Verdeo has just done that. 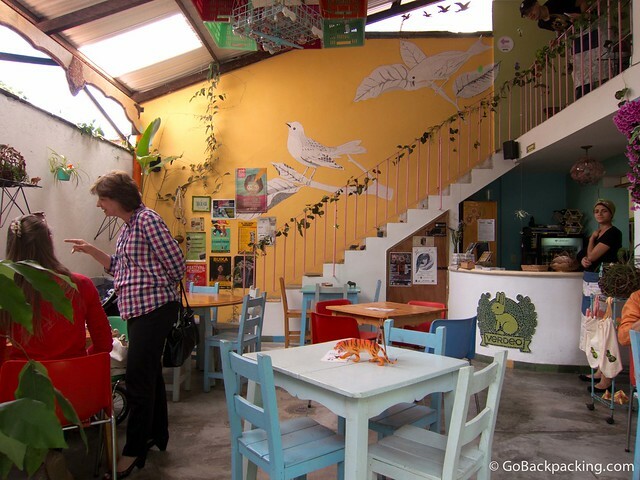 Besides being one of very few vegetarian restaurants in all of Medellín, it is also located in the back of an adorable and super trendy boutique clothing shop. The food choices consist of tofu, grains, humus, falafel and vegan options. I ordered a falafal sandwich and a 5 grain veggie burger which were delicious to the very last bite. Not to mention they had carrot/ orange juice, my favorite! And another great juice of tomato and cinnamon. The restaurant itself feels like its outdoors with cute little tables and one of the walls is lined with VHS cassettes. The waitresses were lovely and sweet and I cannot wait to go back. Thanks for the recommendation. Usually my girlfriend and I go to Govindas in El Centro because we live very close to it but will have to give this place a try. What is the typical price for lunch? THANK YOU for this recommendation! Although I’m not a vegetarian, I do enjoy eating at a good vegetarian restaurant when I haven’t had much luck at the usual overcooked, over-salted offerings at other restaurants. I enjoy reading your blog! Keep up the good work!!! Verdeo prices are 15-20 mil pesos per person (approx $10 US or CAN). The food is a spectacle for the eyes and the senses, there are great and wonderful things happening in their kitchen. I ordered panne cook (vegetables and mushrooms in a cream sauce cooked inside a loaf of artesanal bread) and my wife tried the lasagna. My first bite of the bread was delicious, the sauce and mushrooms inside were divine. The broccoli was cooked to perfection as well. My wife had the lasagna which was a treat to say the least, the flavors were that of a gourmet meat lasagna without the meat, I have no idea what they use for protein, as a previous post mentioned they use mixes of whole grains for the burger though. We were pleasantly surprised by the food (amazing) and the atmosphere, there were two Chilean musicians who stopped by and played some percussion and flute with some vocals in between, it was absolutely delightful and we tipped them $5 mil pesos. The ginger wine was a spicy and aromatic delight, I will skip the organic honey wine the next time but it was interesting. All in all this gets a 9.5/10 rating on the culinary, atmosphere and service fields.. Enjoy the beautiful atmosphere, enjoy the food and wine and don’t forget to come back again and again to try all of the dishes, this is a diamond in the rough as far as culinary achievements in Medellin. Thanks for the notes Christopher, I’d still like to get to Verdeo one of these days.